It was not my first time visiting the Putrajaya Botanical Garden. I recalled visiting it many, many years ago (probably more than 10 years ago) but could not remember much about it. After the enjoyable Putrajaya Lake Cruise with my Filipino friend, it was already late afternoon. I decided to bring my friend to the Botanical Garden. There were many tiles with different scientific name of plants near the car park outside the Botanical Garden. We walked into the entrance building (Visitor Centre) and down a flight of steps. It was free entrance by the way. An information board showing the landmarks around the Botanical Garden. 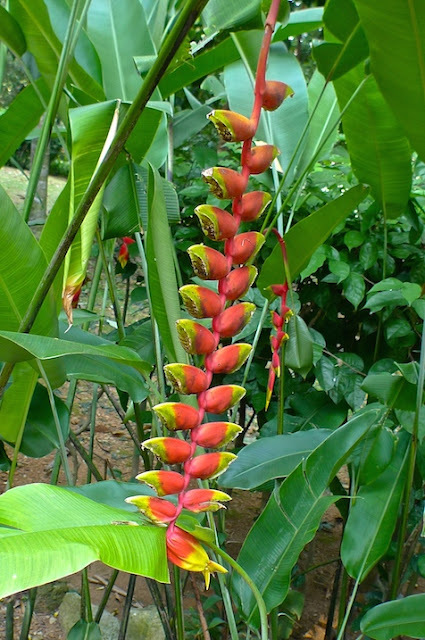 Basically, the garden is divided into five areas - Explorer's Trail, Palm Hill, Sun Garden, Floral Gardens and Lakeside. The canopy bridge was the starting point from the Visitor Centre. You can admire the rainforest trees on both sides as you walk along the bridge. What plant is this? It's known as Terap Nasi in Malay. 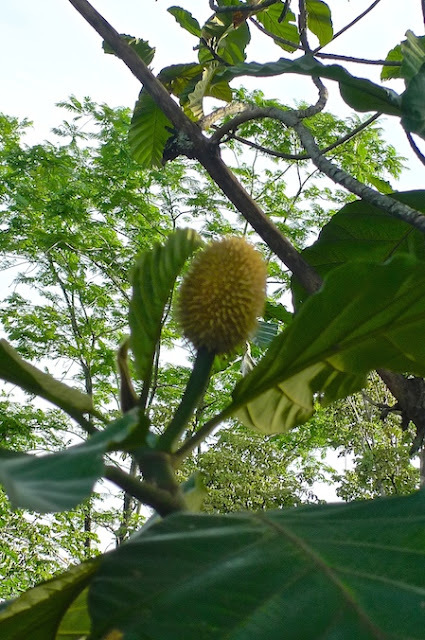 The scientific name is Artocarpus elasticus. The bridge overlooked the Fern Garden below. After we descended from the canopy bridge, we spotted some Heliconia plants. Soon we reached the Palm Hill section. I could not find any photos of palm trees. Oh well, maybe I forgot to take photos of them. I guess this one below will do. Lol. Near the palm trees is the Sun Garden. See that tall white structure? That's a sundial. Nice scenery from here, no? Then we came across these mounds. Not sure what they were or how they were formed. Anyone knows? It was already close to dinner time, so we decided not to cover too much of the Botanical Garden. I think we skipped many of the floral gardens here. Saw these hanging from the tree. Anyone knows what these are? The lack of information on the plants and trees were definitely not helping. Took this photo simply because I like the zig zag pattern of the walkway. We reached the Lakeside Boardwalk. Walked along the boardwalk and enjoying the lakeside scenery. The place was not crowded at all, which I like of course. I guess it's a weekday evening. Ahead we could see waterfall. Or should I call it weir or weir dam? The sun was getting lower and lower in the horizon. We need to make our way to the exit. But first, we enjoyed a little bit of the lakeside. A nice spot to just sit down and meditate, away from the hustle and bustle of the city. As we made out way to the exit, we passed by the Fern Garden. The canopy bridge which we walked earlier above us. We spotted trams near the exit. I guess this tram service already closed for the day since it's already 6pm. There are other facilities here as well like bicycle rental and paddle boat rental. Overall, I enjoyed my visit to the Putrajaya Botanical Garden. It's a nice garden but not great. I would say if you are in Putrajaya, do go for a visit. But if you are not, do not travel all the way to Putrajaya just to visit this botanical garden.